Which of the following is NOT a valid name of a variable in QBasic? If 'REQUEST' is written as 'S2R52TU', then how will 'ACID' be written? How many stairs are there between 6th stair and 15th stair? Between 6th and 15th stairs, the stairs are from the 7th stair to the 14th stair. Hence, there are 8 stairs so the correct answer is C.
What would be displayed on the monitor, when you perform the given steps sequentially with key ON? In option A, the close bracket symbol, should be appearing before the alphabet A! 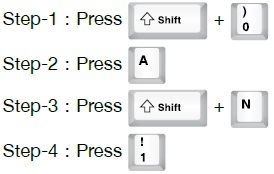 (A) Page Up Key → To move one by one page upwards. (B) Page Down Key → To move one by one page backwards. (C) CTRL + Home → To reach to the opening of the current document. (D) CTRL + End → To reach to the end of the current document. Rio, Seasons, Space and Star Wars are special editions of which of the following computer games? These are the special seasons of Angry Birds so the correct answer is A. If is related to , then is related to ____. Radha and Sarita stay quiet far from each other, they want to discuss the class assignment given by their teacher in summer holidays via internet. What all input and output devices may be needed by them so that they can discuss their homework and also show each other what all they have prepared The name of devices is in jumbled form. Which of the following option when placed in the blank space of Fig. (X) would complete the pattern.